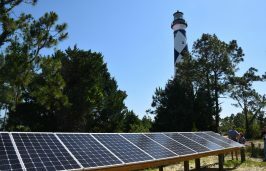 SALVO – Out on a cactus-mined shoreline overlooking a wide and empty Hatteras Island beach, Gabriel Matthias showed off the equipment he had just finished installing. Tall sticks, with an aluminum rod attached halfway up, stood 33 feet apart in a row along the dune line. Their simple, Scout-project appearance belies the part they’re playing in an important new study off Cape Hatteras. Eight pieces of wood, still looking fresh from the lumberyard, held a narrow aluminum rod with an antenna that receives low-frequency radio waves bounced off the ocean. They’re reading the direction and velocity of the waves, coming and going. 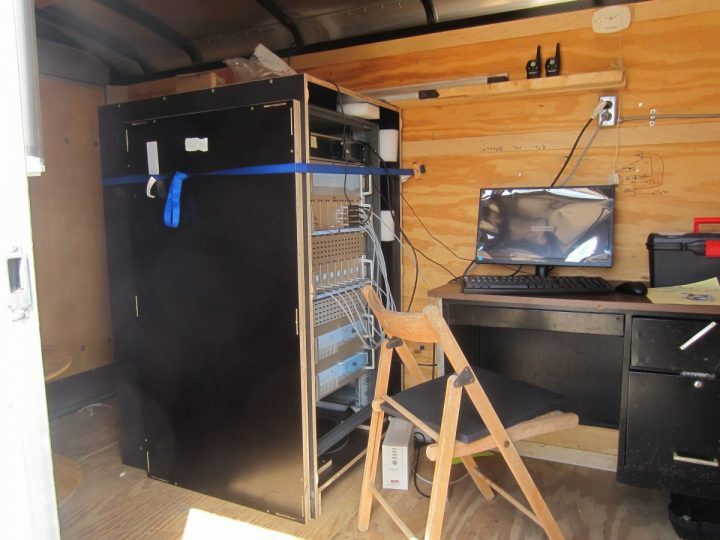 A black cable attached to each antenna snaked across the sand to a trailer where the electronics were stored. Three-hundred feet away, the same number of antennas, arranged in two 36-foot by 10-foot rectangles, transmitted signals about 60 miles out to sea. There had been some explanatory signs attached to a few of the poles, he said, but they proved too skimpy to withstand the ocean wind. More substantial educational signs will replace them soon, so the curious passersby will know the significance of the wired poles. 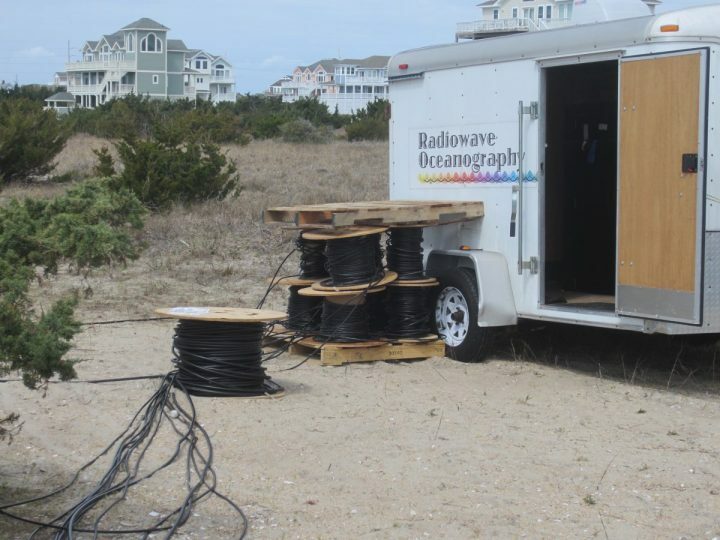 Set up at four different beaches on Hatteras and Ocracoke islands, the radar went live last month. 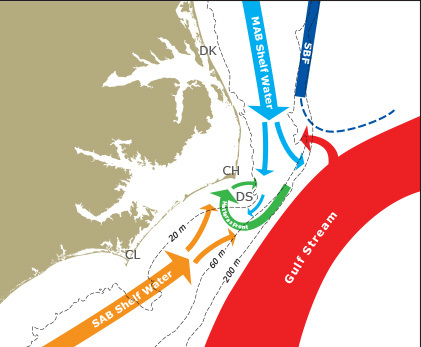 It’s the latest in an ambitious collaborative scientific project to decipher the dynamics of the water exchange between the continental shelf and the Gulf Stream, the ocean speedway that nearly brushes the crook of the Outer Banks. One of the most powerful and consequential currents in the world, the warm Gulf Stream runs north along the edge of the Atlantic continental shelf. At Cape Hatteras, the cold waters of the Labrador Sea converge, creating tremendous movement of water that is very significant and little understood. It is here where the Gulf Stream veers east, toward Europe. 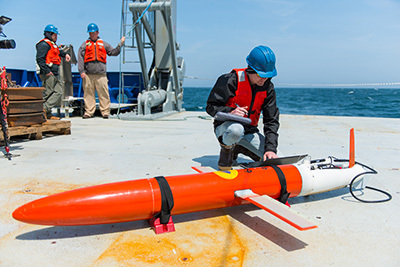 Funded by the National Science Foundation, the four-year, $5 million project has harnessed top-notch researchers and a wide range of oceanographic equipment to focus on processes that control the massive exchange of water between the continental shelf, the Gulf Stream and the open ocean. 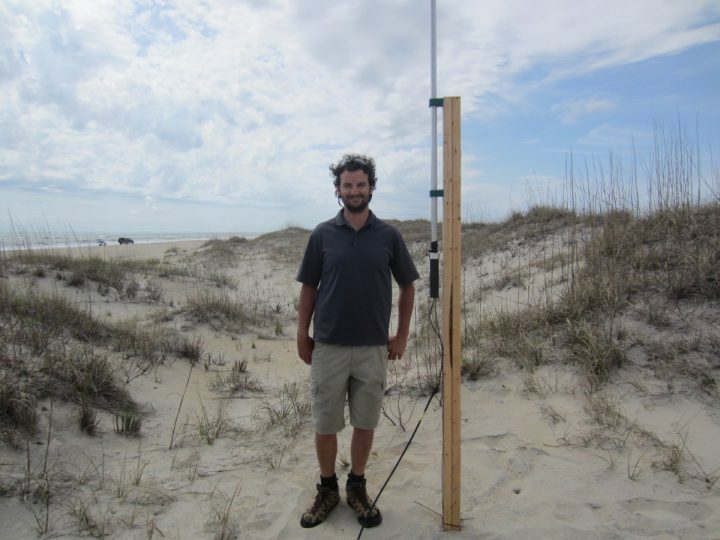 The radar, also set up on beaches in Buxton, Frisco and Ocracoke, is an important component of what Savidge calls a major oceanographic research project. The ocean is a very good conductor, she explained, allowing the radar to go a long way. Waves ride on currents, revealing current speed. Their direction can be determined by the signal’s frequency. Even for scientists, the project name is especially unwieldy: An Observational and Modeling Study of the Physical Processes Driving Exchanges between the Shelf and the Deep Ocean at Cape Hatteras. Out of obvious necessity, the project soon became known by a shortened, more charming version: PEACH. 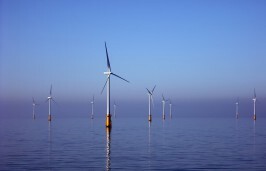 Project partners, in addition to Skidaway, include Woods Hole Oceanographic Institution, North Carolina State University, University of North Carolina Chapel Hill and the UNC Coastal Studies Institute. Reading data and maps on a screen is just part of PEACH’s modeling and observational activities. The data is to be published on a website, Savidge said, and people will be able to look at plots and maps with vectors on them. Ideally, locals will be able to add to the discussion of the data. Thanks to the intense energy of everything happening in one spot off Cape Hatteras, the area has been notoriously difficult to study. For that reason, the research team will use a combination of shore-based instruments – the radar – and ocean equipment. Autonomous underwater vehicles will move along the continental shelf. Called gliders, the vessels have a slew of measuring instruments attached and can fly untethered underwater, sending data via satellite as they go. Soon, the data will be made available to fishermen and boaters. Moorings and upward-pointing echo sounders have also been placed on the sea floor. These acoustic units will track water movement while also recording temperature and density. 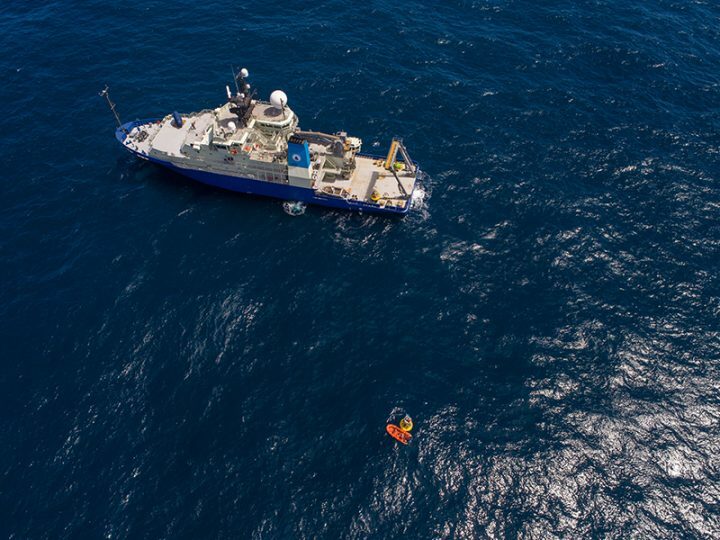 Oceanographic instruments on the 250-foot naval research vessel Neil Armstrong, operated by Woods Hole researchers, were also put to work off Cape Hatteras for two weeks in April. 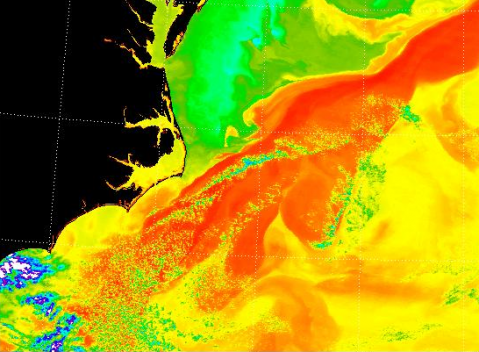 The crux of what scientists are studying at what they call the Hatteras Front has to do with the complicated and mysterious “forcing” mechanisms at the shelf – winds and changes in motion of the Gulf Stream. Cold water dominates the shelf north of Cape Hatteras, and warm water dominates the shelf south of Cape Hatteras, and both drift toward Cape Hatteras. The convergence results in a powerful current directed shoreward. Water depths plunge from about 60 yards at the shelf edge to as deep as 2,000 yards. That’s where the Gulf Stream is. The combination of forcing factors has a profound influence on the volume and momentum in the ocean. Mixed layers of water vary in temperature and salinity and buoyancy. The Gulf Stream carries a huge amount of heat from low latitudes to high latitudes. Scientists want to know the behavior of the water right where it leaves the shelf. The area is in the vicinity of the Point, where oil companies were interested in exploring in the 1980s and the 1990s. Situated about 40 miles off Hatteras, the area is believed to hold trillions of cubic feet of natural gas. But it is also the location of one of the richest areas of marine and bird life in the world. The Gulf Stream travels from south to north, but it also eastward, pushed by variability in western boundary currents, seasonal conditions, atmospheric forcing and shelf water properties. Similar characteristics are found at the Brazil-Malvinas Confluence off the coasts of Argentina and Uruguay and the mixing of the warm Kuroshio and cold Oyashio currents in the Pacific, which are also boundaries between subtropical and subpolar oceanic gyres, or circulating currents, according to PEACH information provided online by the partners. The Gulf Stream is the strongest western-boundary current, Savidge said. “The processes that the Gulf Stream influences will be found in these other locations, too,” she said. The research is meant to answer critical questions about the ocean’s response to climate change and the influence of marine ecosystem dynamics. Water exchanges between the shelf and deep ocean are relevant to global carbon budgets, transport of larvae and pollutants and knowledge of storm tracks and intensity. Recent trends could be harbingers of dramatic shifts in forcing: extreme winter winds; accelerated shelf warming; fluctuations in buoyancy; large deviations in Gulf Stream position; and increased sea level rise north of Cape Hatteras. Advances in observational and modeling systems will provide new capabilities for PEACH scientists to fill in the gaps in knowledge of the processes at the coastal margins. The observations and the numerical models will enable scientists to better anticipate the way coastal systems will respond in the future. 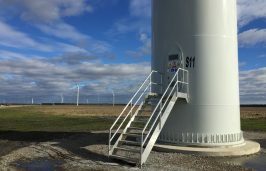 PEACH will benefit from the five years of observations already done off the Outer Banks by the North Carolina Renewable Ocean Energy Program at the Coastal Studies Institute. The state program is studying ways to tap the enormous energy in the Gulf Stream, using both offshore vessels and long-range radar equipment funded by the National Oceanic and Atmospheric Administration. For her part, Savidge has been studying the Gulf Stream for much of her career – her first academic paper about the Gulf Stream off South Carolina was written in 1992 and her first about Hatteras was in 2001. She said she has been working 10 years to pull PEACH together.